LISTEN NOW! John, Greg, and Pat discuss an encounter Steve Strang had with Pastor Alveda King and Naomi King, Martin Luther King Jr.’s sister-in-law when they visited with each other in Atlanta, Georgia. In this segment they continue to speak about Dr. King’s character and how people have tried to coop Dr. King’s legacy and say that Dr. King would was doing the same thing that Saul Alinsky wrote about in Rules for Radicals. Dr.King’s own words, his own example and now the testimony of others all say that Dr. King would not use “Lucifer’s” tips for organizing but instead allowed himself and his movement to be organized under the supreme organizer Jesus. Naomi recounts a time when she was visiting Dr. King in 1955 after his first daughter Yolanda was born. She continues to share an account when Dr. King walked in his home of which she was in and begins to share how he was detained by the police and how they tried to choke him to death with his tie. Dr. King’s response was true wisdom then and it still true today. He said speaking about that incident “The more they mistreat us and abuse us, the more we must love them and forgive them because hatred is very much alive.” Naomi said it was that moment when Dr. King was 26 years old that she began to see that he was being molded for his assignment and that was because of his regard for God and people. How can we not do any different? Greg, John, and Pat discuss how God spoke to Greg and showed him through a game young children play, inny, minny, miny, mo, that this is how selective births were taking place with the rest of the children being aborted. Since Roe V. Wade in 1973, 50 plus million children have been aborted resulting from parents choosing which baby they will keep and which baby they will murder and sacrifice to the God of Molech the Bible speaks of in Leviticus 20:2-5. In this country children are being sacrificed at an alarming rate if this does not stop and repented for we will lose our nation. Innocent blood is still crying out from the soil in our land. This nation that was founded as a Christian nation is not different from Communist China that kills their babies at will through gender selection. They continue to discuss how evil Satan is as he will get you to commit a sin and then shame you once you have done it and cause you to come under condemnation. However, there is not condemnation in Christ only conviction and conviction is to lead you to repentance that you may receive forgiveness. There is a way out and there are ministries and organizations that will help so that you don’t have to have an abortion. Holy Father, forgive us and cleanse our land. Dear God, end abortion send revival! Greg, John, and Pat discuss the importance of being a watchman on the wall. They continue to discuss the powerful outpouring that occurred in Pensacola, FL, known as the Brownsville Revival. During the revival Bro. John Kilpatrick would host pastor conferences for pastors from all over the world. During the pastors conference different people would carry very large banners with different themes to pray over everything from family, government, the church, etc. Greg shares that it just so happened that every pastors conference they would need help to carry the banners and he would always wind up getting the Catastrophic Events banner. 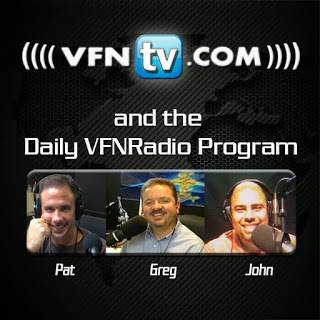 He was watchman then and still is one now as VFNRadio expands to CTN, Christian Television Network, where a trumpet of warning can be heard throughout the southern region and the world.